Most of the Backpackers hostels in Pakistan are owned by people who love to travel, see beautiful places and experience different cultures just like you. What makes us different from most other places where you could stay is that we love what we do, and that is the reason we opened our hostels. As always backpackers talk about the hostels they enjoy the most. Because of knowing each other through backpackers we decided to create this website. Sajjad is the man incharge of our newly opened/friendly hostel.We have a roof top garden with a nice view and we,re right in the middle of town,'in the heart of Lahore'. 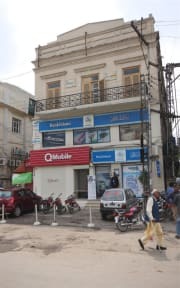 Travelling in Pakistan can be quite rough sometimes,so our place is the perfect location to relax.The 'Lahore Backpackers' is even licensed ( under the Pakistan Hostel & Restaurant Act ) to operate as one star hostel.but the prices remain reasonable.Yes,our Hostel is quite new.but our experience with foreigners is long. Sajjad is 'The man of connections' and he has been helping out with visa matters,border crossing,transport,sight seeing,visiting festivals & the music events for the last two years. We welcome you & hope to meet you soon. ( kind regards & save travels ).